Create enjoyable, inviting community spaces by maintaining clean, debris free atmospheres with receptacles from the Oxford Collection. Premium 36 gallon all-steel trash receptacles that are upscale and durable—great for indoor and outdoor high volume use. 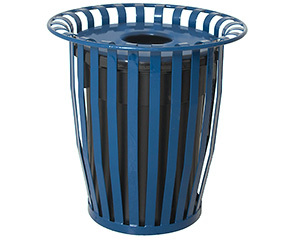 Slat style design with flared rim with a choice of flat top, ash urn or rain bonnet lid and available in a popular selection of colors these receptacles are ready to fit in.